Who needs instruments when we have mouths? You might think a cappella is only for people with beautiful singing voices, and you’re usually right — except for this week. That’s because this week I graced Sproul Plaza with my dulcet tones. In a cappella, voices must blend seamlessly in perfect tonalities; a missed note can bring down a whole harmony, and the group I brought down with me was UC Berkeley’s own Noteworthy, an organization known for composing original pieces. Noteworthy’s offer was to allow me to attend a rehearsal, and if all went well, I could join them for one song on Sproul Plaza. The last time I sang in public, it was for a fifth-grade play and I’m not sure how I felt about it at the time, but I look back now and cringe. So before rehearsal I spoke with Kunwoo Hong, a member of Noteworthy and two other a cappella groups, to prepare myself for the big gig. Ryan Melvin: How much of singing do you think is natural talent, and how much is just practicing a lot? Kunwoo Hong: For some people, they think pop stars have been singing their entire lives, but really natural talent only gets you so far. As with any kind of skill, if you practice toward getting better, you’ll always get better. RM: That gives me a little bit of hope. You’ve been doing this for how long? KH: I’ve been in Noteworthy since my freshman year, so about 3 and a half years. I actually came in without any singing experience. I have a pretty big musical background, but not much in vocal experience. RM: You must have some advice for me then, since I’m really inexperienced, as far as having the confidence to sing. KH: Confidence, with Noteworthy, has been a really big theme because we’re flashy, we put ourselves out there. Because you’re in a group setting, it makes it a little bit easier because everyone is also doing it around you. RM: How do the voices blend so well, and how long does it take for a song to sound harmonious? KH: People are born with different voices, and everyone sounds different when you talk to them. So it’s using that and blending it with some basic skills. I consider Noteworthy to be a teaching group, so we teach a lot of vocal technique. We usually don’t finish a song for a couple weeks, but ones that are much shorter only take a couple hours. RM: How much do you think I can realistically improve over the course of just one rehearsal? KH: If any of the past members have taught me anything, you can learn a lot in just 10 minutes based on certain things we tell people every rehearsal. We always give them the same speech about vowel shapes or how to make your tones sound better. In one night, if it’s just one song, we can get that song learned and sounding pretty good by the end of today. RM: Do you have any last tips or tricks of the trade for me? KH: For any sort of performing thing, it’s about enjoying any little part and that will help you enjoy the entire thing. Have fun with it because if you mess up or something goes wrong, if you play it off and enjoy it, that will make the performance more enjoyable for other people, and you’ll realize even if you make a mistake it will be okay. When the day came, Sproul Plaza was flooded with hundreds of people, dozens of whom were paying attention to the show. That was still enough to make me uncomfortable, but with Kunwoo’s beatboxing guidance, the song went without any major blips. I said most of my wows, bows, dees and deeps at the correct time, and my tone was probably fine, yet at the end of the song it still felt undeniably awkward. However, I figure that feeling is probably unavoidable if you’re doing a cappella publicly for the first time. Seeing the easy smiles on the members of Noteworthy’s faces indicated that eventually it’s more fun than awkward. I’m just nowhere near that point. As for Noteworthy, have you ever seen eight Asian guys and two white guys transform into early 2000s Britney Spears for a sensually choreographed rendition of “Toxic?” Unless you’ve been to one of their shows, you haven’t, but you really should. 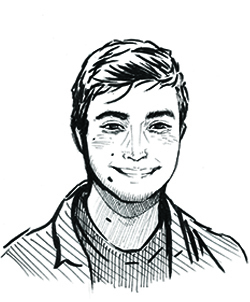 Ryan does the hardest things at UC Berkeley and writes about them. Contact Ryan Melvin at [email protected].